Meditation SeriesPlease sign up to our mailing list to be notified of new healthy living related content. 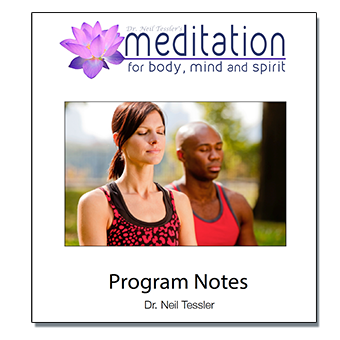 Welcome to Dr. Tessler's Meditation Series for Body, Mind and Spirit. Meditation is a perfect complement to a holistic view of wellness, as well as a pathway to greater self-awareness. Dr. Tessler has created this unique meditation series to help bring more peace, joy, calm and improved health to your life. When practiced daily, research has shown that meditation reduces stress, improves memory, helps regulate moods and emotions, and may improve physical healing. Download the Program Notes here for a general introduction to the program, as well as tips on sitting postures, and a presentaiton on mantras. The program consists of twelve talks written and narrated by Dr. Tessler. Each talk is 10-15 minutes and is followed by about 20 minutes of meditation. The first meditation ends with a few minutes of silence with musical accompaniment. The second and third meditations include about ten minutes of silence also with music. The first three talks are followed by each of the three guided meditations in turn. Talks 4-12 are followed by the Jyoti (Light) Meditation, though you are free to choose according to your preference as the guided meditations come separately lower on the page. The music that accompanies the meditation portion was composed by Julie Blue, International film composer, recording and performing artist. See the synopsis of the talks below the audio player. Talk 1: Introduction to Meditation: Introduction / best posture for meditation / best time for meditation / regularity/objections to meditation / ways to help out the mind. Talk 2: Why Do We Meditate: Balance / poor cultural habits / objections again / meditation and escapism / scientific benefits / meditation and personal development / meditation and spirituality / meditation and the mind. Talk 3: Use of a Mantra: An introduction to the topic of mantras with examples from Christian, Islamic and Tibetan traditions with discussion of their meaning. Talk 6: Discovering Our True Identity: How we forget and return to our true nature / discarding prejudice / the universal experience of light. Talk 7: Stretching: Our potential and our limitations / consciousness in different life forms / the desire for self-knowledge / my favourite movie. Talk 8: What Does It Mean to Grow: Conscious growth vs. normal maturation / indications of maturity / helping factors / the role of meditation in self-care. Talk 9: The Power of Creativity: Feeling awareness / tools for accessing deep emotion / the importance of creativity. Talk 10: Who Sees When the Mind is Still: Locating the Self / anxiety and meditation compared / Vrittis / more benefits of meditation. Talk 11: The Eight Limbs of Patanjali’s Yoga: A brief review of the structure of physical and spiritual development through yoga as described by Patanjali (400 BC). Talk 12: The Energy in the Shadow: The world as a mirror / the structure of the personality / the Shadow / the path of ascent and the path of descent. Each meditation is attached in turn to the first three talks, Breathing and Grounding with Talk 1, Jyoti Mediation with Talk 2, Grounding and Jyoti Meditation with Talk 3. After the first three talks, the Jyoti Meditation has been attached to each of the subsequent talks, though you have the freedom to choose according to your preference as the meditations also come separately. The second and third guided meditations include ten minutes of silent practice accompanied by music. Once you have experienced each of these meditations, use the one that resonates best with how you are feeling and what you may need for that particular day.